Of Moss and Stone is the 2014 split between Colorado’s Defeast and Uaithne, a project from Los Angeles. Defeast has been pumping out a steady stream of releases since forming in 2008, all instrumental since the release of 2009’s Eroding Peaks. Uaithne only seems to have one EP, Approaching Light, which was released in 2013. The split is offered on cassette through Red River Family, which places each bands tracks on opposite sides of the tape. Though it’s a nice looking release, the offering sounds much better as presented in digital form. Each band takes turns through the five tracks, starting with Uaithne’s upbeat brand of neofolk. Despite their urban Californian origins, Uaithne’s three tracks sound rooted in the folk music of the Appalachian region. Upbeat acoustic guitars with subtle accompanying string movements and minimalistic percussion, most likely some type of hand drums. I imagine this type of music could have been played in some remote West Virginia tavern in the early 1800’s, as it revels in the glory of nature without words. Deafest offers two tracks of self-ascribed Rocky Mountain Black Metal. 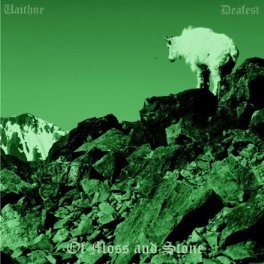 Much like Uaithne’s tracks, Deafest revels in the wonder and grandeur of nature, although it’s done in a more harsh style. Taking cues from the Cascadian movement, the tracks are full of classy trem riffing and fast paced, rollicking percussion. The tracks are more confident than the project’s early release, as Deafest’s multi-instrumetnalist Chase Ambler continues to settle into a comfortable little niche of nature loving black metal. Perhaps the tracks sound more aggressive because they are paired next to Uaithne’s smooth folk passages, but it really helps to embody the feel of the harsh, craggy mountaintops from which Deafest draws inspiration. Combining to nature loving bands with vastly different ways of paying homage, Of Moss and Stone is a wonderful album if you’re into neofolk and Cascadian black metal. There’s really nothing new here, but the interplay between the Appalachian tinged folk melodies and the harsh, cold black metal are breathtaking. Deafest has continued to work on new material since this split dropped and Uaithne has seemingly disappeared back into the shadows. This entry was posted in Reviews and tagged Appalachian, black metal, Deafest, neofolk, Red River Family, Rocky Mountain Black Metal, Uaithne.